The flesh of Averrhoa carambola or Country Gooseberry is crunchy, firm and extremely juicy. 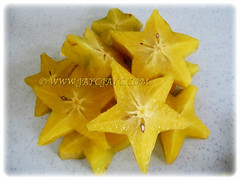 Starfruit does not contain fibers and has a texture similar in consistency to that of grapes and usually eaten as is. Fresh fruits may be used in cooking and are used in salads, punch bowls, juice, preserves, jam and jelly. 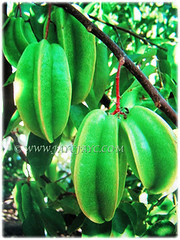 Botanical Name: Averrhoa carambola (syn. : Averrhoa acutangula, Sarcotheca philippica). 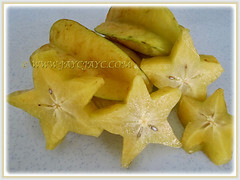 Common Names: Star Fruit, Starfruit, Carambola, Caramba, Country Gooseberry, Belimbing Manis in Malay. Etymology: The genus name, Averrhoa is named after Averrhoes (1126-1198), a well-known Arabian philosopher and physician. 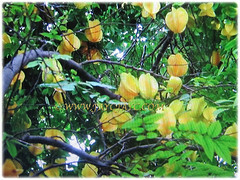 The specific epithet carambola is from the word karambal of the Marathi language, which also means carambola tree. Origin: Native to India, Nepal, Sri Lanka, Vietnam Malaysia, Indonesia, the Philipppines, Mauritius and Seychelles. It widely cultivated elsewhere around the world.. The Carambola tree is slow-growing, small to medium in height reaching 7-10 m tall and spreading 6-7.7 m wide. It is single or multi-trunked, broad and bushy with branches usually drooping. The bark of the trunk is light brown, smooth or sometimes finely fissured. 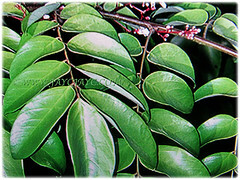 15-25 cm long and green leaves are pinnate and alternately arranged on branches. Each leaf has about 5-12 green leaflets, 1.5-9 cm long and 1-4.5 cm wide. They are sensitive to shock and will close up when the branch is shaken. Pink to lavender coloured 5-petaled flowers are borne on a panicle inflorescence about 2-5 cm long. Each small flower measuring about 0.6-1 cm in diameter has five petals and sepals. They are borne on twigs or small-diameter branches and occasionally on larger wood. Flowers open during the daytime. Eventually, the flowers will be followed by waxy fruits. Fruit is an indehiscent berry measuring about 5-8 cm long and turns from yellowish-green to orange-yellow when ripen. Per fruit contains 5 edible seeds, 0.6-1.3 cm long, thin, light brown and enclosed by a gelatinous aril. The fruit has distinctive ridges running down its sides, usually five but can sometimes vary. When the fruit is cut in cross-section, it resembles a star, hence its name. It takes about 60-75 days from fruit set to maturity depending upon variety, cultural practices and weather. 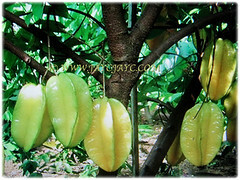 Culture (Care): Averrhoa carambola or Star Fruit can be easily grown with least maintenance. Moisture: Moderate water requirements. It does not tolerate flooding and needs good drainage. Soil: Fertile loamy, slightly acidic and well-drained soils. Others: Carambola trees are intolerant of constantly windy conditions. Prune the tree regularly to maintain its height between 1.8-3.6 as the mid-canopy area, 0.9-2.1 m is the major fruit-producing area of mature trees. Feed the tree four times a year with a balanced fertiliser for fruit tree. Kindly take note that people who have been diagnosed with kidney disease should not eat Star Fruit unless their doctor says that it is safe for them to eat. This fruit may contain enough oxalic acid to cause a rapid decline in renal function. Generally free from serious garden pests and diseases. Nonetheless, the fruit is subject to fruit fly, fruit moths and fruit spotting bugs in those areas having these infestations. For subtropical and temperate regions: Hardiness: USDA Zone 9a-11. 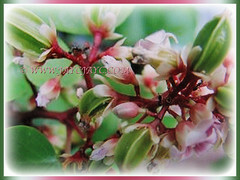 Averrhoa carambola or Starfruit tree grows well in tropical and warm subtropical regions that experience only occasional freezing temperatures. Although, Carambola trees are evergreen, when grown in cooler locations, they lose some or all their leaves during the late winter and early spring. Trees grow rapidly in locations protected from strong winds. The mid-canopy area, 0.9-2.1 m is the major fruit-producing area of mature trees. The range of temperatures for best growth and fruiting are 20°-35°C. Generally, trees stop growing at temps below 18°C. Air temperatures of -1.11° to 0°C may kill young leaves. Young trees, twigs, and mature leaves may be killed at -2.77° to -1.66°C. Small branches may be damaged at -3.88° to -1.66°C, and large branches and mature trees may be killed at temps of -6.66° to -4.44°C. Symptoms of freezing damage include leaf wilting, water soaking, desiccation, stem and limb dieback, fruit drop and tree death. Carambola trees are intolerant of constantly windy conditions. For non-hardy regions, grow it in a container to easily overwinter indoors. Alternatively, plant it in a greenhouse or conservatory with optimum light. Propagation: Easily propagated via seeds and grafted on seedling rootstocks. 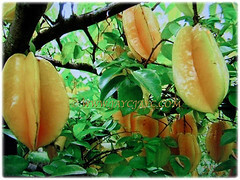 Usage: Averrhoa carambola or Country Gooseberry produces edible fruits. The entire fruit is edible including the slightly waxy skin and is usually eaten out of hand. The flesh is crunchy, firm, and extremely juicy. 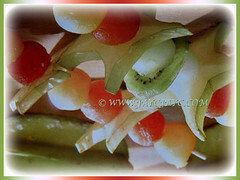 Fresh fruits may be used in cooking and are used in salads, punch bowls, juice, preserves, jam and jelly. Carambolas are best consumed shortly after they ripen, when they are yellow with a light shade of green or just after all traces of green have disappeared. Fruits picked while still slightly green will turn yellow in storage at room temperature. 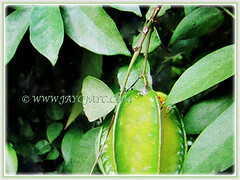 Starfruit are great sources of antioxidants and Vitamin C. Besides, it contains medicinal properties whereby the fruits can be consumed as a laxative. Its wood is used for firewood. The unripe fruit can be processed and used in dyeing. Plant the Starfruit as it attracts birds, provide food for caterpillar and moth, especially the Attacus atlas.